We Have Helped Thousands of Bursitis Sufferers End Their Pain Over the Past 10 Years. Before you decide on a treatment path, an understanding of the three major stages of the healing process is critical. With the right knowledge and the right treatment options, you can accelerate your recovery without the fear of re-injury or setbacks (which unfortunately, happens a LOT with bursa injuries - we will explain why further down the page). Regardless of what bursitis you may be suffering from (knee, hip, shoulder, elbow, ankle), the treatment stages are the same. The location of the treatment is wherever the inflamed bursa may be. Inflammation is the body's natural response to a soft tissue injury and is a normal part of the healing process, helping to reduce tissue infection in the early stages of injury. Swelling, pain, heat sensation, redness, and loss of function are the main symptoms experienced and it is your body's way of telling you there is something wrong. The combination of rest, topical pain relief cream and the use of a Cold Compress or Ice Pack (when there is swelling) is the gold standard in medicine for minimizing tissue damage and reducing inflammation after injury or activity. It serves as a critical starting point before continuing into the next phase of the healing process. Bursae, tendons, and ligaments are considered soft tissue although they are also very dense. As a result, they naturally receive very little blood flow and this is precisely why injuries to these tissues take so long to heal. The challenge is - how do you effectively increase blood flow to these tissues in the bursa? It is through the blood the body carries the nutrients, oxygen, and antibodies the injured bursa (and surrounding soft tissue) needs to repair and rebuild. Research shows electromagnetic energy to be very effective as a treatment for stimulating blood flow to dense tissues such as tendons, ligaments, bursae, muscles, and even portions of cartilage. This dramatically improves the healing process. When you have a bursa injury, there is reduced blood flow to the injury site. Inflammation and reduced movement (lack of activity or on-going immobility) will reduce the flow of blood - and if you think about it, this makes sense. Moving the joint(s) where there is bursitis is very painful, so it is very common for bursitis sufferers to have significantly reduced mobility; over time, this leads to atrophy - a shortening of muscles, tendons and ligaments of the joint. As your bursa heals, you run a high risk of straining your muscles and tendons as they have become shortened due to lack of use - leading to more soft tissue injures and possibly putting you into a chronic soft tissue injury cycle. Electromagnetic energy is an energy waveform that is absorbed by dense tissue (muscles, tendons, ligaments) and absorbed much less by low density tissue (fat cells, skin). Absorption of this energy translates to heat, and the body increases blood flow to the area as a response to the heat. This increased blood flow speeds up the healing process of the body, clearing the area of toxins and excess fluid build up, thereby reducing inflammation. This process is simply known as DTR Therapy, and stands for Deep Tissue Rehab. This is a very important tool for complete and fast healing! In our experience, soft tissue repair rates via conservative home treatment methods using a dedicated, comprehensive approach have surprised many of our clients, but will differ from person to person. In nearly all cases, however, it is very important to stop whatever you were doing that created the injury in the first place (ie. running, repetitive movements at work, etc). Most of you are reading this because you suspect you have a bursa injury, or perhaps you have already received a confirmed diagnosis. Either way, you are most likely interested in learning; what are the steps I need to take to properly heal bursitis? We receive questions like this on a daily basis. The approach we take is based on years of experience and based on sound, scientific principles. We discuss these approaches in-depth further down the page and throughout the rest of the website. Before getting into that however, it is important to understand the characteristics of the bursa and the role it plays within the body. A bursa is a closed, fluid-filled sac that functions as a cushion and provide a gliding surface to reduce friction between tissues of the body around joints. Essentially, a bursa provides a slick surface so that tendons and ligaments can "slide" across a bony prominence so it doesn't catch or rub against the bone. The major bursae (bursae is plural for bursa) are located adjacent to tendons near large joints, such as in the shoulders, elbows, hips, and knees, though there are hundreds of them throughout the body. Bursae will typically develop as the body needs them, and it is not uncommon for some people to have bursae in an area where others do not. Once a bursa becomes inflamed, the condition is known as bursitis; if the bursa becomes infected, it is known as "septic bursitis". Septic bursitis is not something to take lightly, as an infected bursa can spread infection throughout the body and become life-threatening. So I Think I Have Bursitis - What Should I Do? If you suspect you may have bursitis, go consult your physician. Only your physician can truly diagnose bursitis, and from this, determine a course of proper treatment. After seeking medical advice, your physician may opt to aspirate the bursa, remove the bursa (known as a bursectomy), inject cortisone into the bursa, or recommend conservative treatment options. How Long to Recover from Bursitis? If you have pain and/or swelling within or around a joint, you may have bursitis. See your physician if symptoms do not go away within a few weeks. It can take several months to get rid of bursitis, though conservative treatments and/or medical treatment can speed up the process. It is important to deal with bursitis quickly - the longer bursitis continues, the greater the chance this injury will cause secondary injuries such as tendinitis or muscle strain due to decreased Range of Motion that will eventually occur. If a bursectomy is undertaken, you will find we have effective solutions for post-surgery recovery. Reduction of inflammation reduces pain, enhances range of motion and minimizes scar tissue growth. You can read more about effective options for pre/post bursitis surgery here. Why is Fast Healing Important for Bursitis? Once a bursa becomes irritated and inflamed, recovery time is lengthy, requiring a reduction in activity for a long period of time to allow the bursa to heal. This is why many bursitis sufferers start having muscle atrophy and tendonitis problems near the injured bursa. An inflamed bursa will often starting causing nearby tendon inflammation, and your immobile joint will begin to lose more flexibility as unused muscles shorten over time (atrophy). This is why it is important to heal your bursitis as quickly as possible - you need to avoid the vicious cycle of tendonitis and decreased Range of Motion that will occur with chronic (long term) bursitis. Before we go further, it is important to understand that your body is capable of healing itself. This is why your physician will always try to opt for the conservative treatment first - usually, it works although it takes time to heal. Your blood flow carries oxygen and much needed nutrients to injured cells in the body while also flushing away toxins and waste at the same time. When you have a bursitis injury, however, there is not much blood flow in the bursa, and since you are not moving the area much, the blood flow to the area is further minimized. Also, joint movement where the bursitis is can increase the severity of the injury. 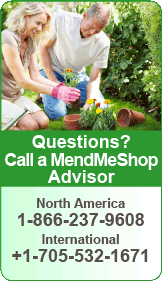 If there has been some healing, you could re-injure yourself if your joint is not immobile. Blood Flow (the natural healing process in your body) needs assistance for such injuries because blood flow is greatly restricted when you are immobile. When treating bursitis, an effective therapy will increase blood flow to the injured area while the joint is immobile. The increased blood flow will accelerate the body's own ability to heal itself. It goes without saying that anyone suffering from bursitis should want to minimize their chance of worsening the injury, or re-injuring the bursa once it has started to get better. Obviously, a worsening injury will delay the healing process, but what's worse is that every re-injury and additional healing cycle increases the amount of time that your joint is immobilized. Time is hard on an immobilized joint - you lose strength in the joint but worse than that, you lose the range of motion in your joint via atrophy (your flexible tendons, muscles and ligaments slowly shrink, decreasing joint elasticity). The more time that goes by with an immobile joint, the more likely you will wind up with a chronic joint problem (long term injury such as tendonitis or persistent bursitis pain). Basically it means that your joint will not perform as well as it once did and it becomes more prone to injury again later on. If you have an inflamed bursa in one of your joints, it's very important to heal it quickly and completely. Minimizing the healing time of your bursitis should be an obvious goal, as bursitis typically limits your ability to go about your daily routine. As stated here (MedicineNet.com), if your long-term (chronic) bursitis is left untreated, calcium deposits can form within the bursae. These calcium deposits can lead to permanent stiffness in the affected joint. If you would like to talk with one of our AidMyBursa advisers, we welcome you to call our office toll-free at 1-866-237-9608, or internationally at +1-705-532-1671. Recovery from a bursitis can take a long time, especially when some of the less effective, traditional methods are utilized. This is simply because many treatments either focus on masking of pain or are too inconsistent to provide sustainable improvement. The issue we find with cortisone injections is that people get a false sense that their injury is healed because they are not experiencing the pain they once did. Some individuals even engage in activities they should not be doing because they "no longer feel pain". Once the effects of the cortisone wear off in a few days or a week, people often find their bursitis persists . This of course, results in a prolonged recovery. While the benefits of physical therapy are very real and we believe it to be integral for recovery from soft tissue injuries, the problem is that people only attend sessions a few times a week. To truly provide a long term solution to combat bursitis induced soft tissue damage, you need to be receiving multiple treatments on a daily basis and get rid of your bursitis asap. Not just any type of treatments, but ones that focus on generation of new healthy tissue - along with proper synthesis of that tissue as well. This is the third and final reason for extended bursitis and soft tissue injuries. We see it all the time - people for weeks and even months only focus on using cold therapy. The truth is, there will always some mild inflammation associated with tissue injuries. However, some of that inflammation will remain UNTIL you begin to focus on healing the soft tissue (muscle). Once this begins to heal, the inflammation will then subside more permanently - not just temporarily like with cold therapy treatments. If you've been living with the agony of bursitis for some time now, it's almost a sure thing that you're feeling discouraged, tired, and worn-out. Some bursitis sufferers we have spoken with have been confined to a wheelchair - just due to the pain of their bursitis! Seemingly simple chores are now impossible - like getting in and out of a car, cooking a meal, or just standing and walking for significant periods of time. The constant pain has no doubt interrupted your sleep, just adding to the long-term misery that this condition can bring on. Inflamed bursae cause extreme pain and reduce your ability to move. It can be very challenging to keep a positive attitude and outlook when suffering from the pain and immobility that bursitis can bring. If you choose not to deal with your bursitis, you may end up in a long term downward spiral. What ends up happening is that bursitis will often freeze you up over a long period, cause overcompensation injuries and decrease the range of motion in your affected joint (which can by itself cause secondary soft tissue injuries). This will definitely set back your recovery and in some cases, it can trigger a long term problem that never goes away (reduced joint mobility, tendonosis, permanent limp). In the case of one of our previous clients, he was confined to a wheelchair for over 2 years specifically due to a chronic bursitis problem - believe me in saying this - it is important to not ignore bursitis. Every time we use our joint where there is painful bursitis, tendons and muscle tissue move; when they disturb an inflamed bursa, every movement hurts. With injured tissue, pain happens - sometimes a LOT of pain, so we try not to move it. So, when doing something we need to use our affected joint for (climbing stairs, getting up from the sofa, moving a car wheel, walking to the mailbox), we start to use the non-affected joints more. In the case of shoulder bursitis, we use our other shoulder instead even though it is inconvenient. 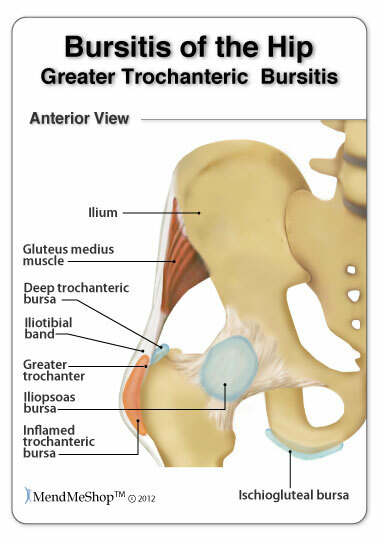 In cases of hip bursitis, you may find you are using your knees and back more - and so forth. A couple days later (after purposefully avoiding movement of affected joint), the pain has gone down (as well as the swelling) and this is where the trouble begins! The pain disappeared with the swelling but we still aren't fully healed! Not knowing this, we start using our joint again and then the injury swells up again like it did before - all because the injury wasn't fully healed in the first place. Eventually, we use the other leg/shoulder/arm more and more, over a lengthy period of time. This is why the other joints start to hurt - they are being overused and taking the load that your affected joint once did. Soon, aches and pain can become commonplace elsewhere in the body - all as a result of the original bursitis injury and the body's instinctive nature to "protect" the original injury - all because the injury wasn't fully healed in the first place! We continually re-injure ourselves through our daily activities and now we are dealing with long term chronic injuries due to atrophy and overcompensation. An injury to one bursa can easily lead to straining in other areas, making an overall recovery hard to initiate. For example, a serious case of bursitis in the right knee can often lead to over-straining of the left knee and even hip. Most commonly, the injury occurs on the dominant side, so the risk of straining the other (weaker) side increases. The longer the injury (and corresponding pain) persists, the greater the chance that you will sustain more strain from overcompensation, eventually leading to issues in those areas as well. To minimize potential secondary injuries, know that it is important to deal with your bursitis injury quickly and completely. Truly, bursitis pain can trigger a vicious overcompensation and re-injury cycle - which is why it is absolutely critical to focus on healing methods designed to rebuild and strengthen the injured bursa in a timely manner. The faster you truly heal, the less chance you have of sinking into a downward spiral of re-injury, scar tissue growth, atrophy and overcompensation injuries. Okay, So I Have Bursitis ...What Should I Do Now? If you suspect you may have bursitis, the first thing to do is consult your physician; only your physician can give you a proper diagnosis and from this, determine a course of proper treatment. After seeking medical advice, your physician will determine the degree of severity and whether or not it is infected (important!). An infected bursa is known as septic bursitis and can be life threatening - so get it checked out! In some cases of bursitis, your physician may recommend removal (known as a bursectomy) in which case a conservative treatment protocol would be recommended after your skin heals up from surgery. If other cases, your physician will almost always recommend conservative treatment options. A general outline of our conservative home treatment recommendations follow.. Stage 1: If the bursa injury is very recent - use a good quality cold pack and Arnica Pain Relief Cream. If the injury has been going on for awhile and inflammation is reduced, then skip to Stage 2 below. If you are experiencing pain and swelling in the very early stages of the injury (first 48 to 72 hours), the first step in a conservative treatment protocol would be to focus on reducing the discomfort by applying a Cold Compress or Ice Pack to the injured bursa along with a high quality pain relief cream such as our Arnica Infusion Cream. after any activity that puts stress on your bursa (and surrounding soft tissue) in a moderate way. It is wise to quickly apply cold therapy to not only reduce the pain, but to also minimize tissue damage that may have occurred during the prior event. If you have a job that requires you to place some demands on your injured joint. If that is the case, use cold therapy immediately following work and if the opportunity allows - use it for 15 to 20 minutes during lunch or another break time. Even though the concept is simple, improving blood flow to injured soft tissue (bursae, muscles, tendons) can be difficult. When talking about blood flow in the bursa, challenges are even greater as bursae receive very little blood flow. Traditional methods require your muscle to move to promote blood flow (exercise), but that same motion that promotes blood flow can at times lead to making your pain and condition worse. Have you succumbed to re-injury by returning to work too quickly? How many times in the past have you aggravated your bursitis just trying to perform basic tasks around the home? Promoting blood flow within a soft tissue injury to help the body heal itself is a concept that has been utilized for centuries. This is where the focus has to be if you are seeking long-term improvement. The real challenge is how do you promote blood flow to your bursa and surrounding soft tissue without causing further injury? Electromagnetic energy is a form of energy that will easily penetrate through clothing, skin, and fatty tissues... directly into your injured muscles, tendons and bursae - deep within your body. After the energy is absorbed, the metabolic response then kick starts the repair and rebuilding process. More blood now begins to flow effectively to the injured tissues deep within the body. The injured soft tissue uses the added blood flow to heal as it is through the blood the body carries the oxygen, nutrients, and antibodies needed for proper and long-term healing. Research is continuing and soon, much of North America will know what the Far East and Europe has known for a long time; electromagnetic energy provides a wide range of health benefits for those not only suffering from bursitis injuries, but for many other ailments (plantar fasciitis, bursitis, tendinitis, Tenosynovitis, frozen shoulder, golfer's elbow, tennis elbow, etc.) as well. 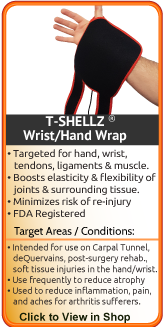 The best option we came across in our research to accomplish true healing of deep tissue injuries (such as bursitis) is the T•Shellz Wrap®. Use of this device results in an increase in deep heat. The body would then respond to this deep heat via an increase in blood circulation, thus enhancing the body's ability to heal soft tissue in the treatment area - all in a non-invasive manner. Have you seen what happens when you add water to a flower wilted from drought? In essence, your bursitis injury is much like a "wilted" flower; your body wants to heal its injury, but needs lots of nutrients to do it. Blood brings new life to your cells by delivering healing nutrients and oxygen that are vital to your tissue. In addition, the blood carries away toxins and cellular waste cleaning the area and healing it faster. Without a good supply of blood, your bursa simply won't heal properly. Using a T•Shellz Wrap® will not expose you to the risk of causing further harm to soft tissue like you can when using rigorous exercise. The T•Shellz Wrap® accomplishes the goal of indirectly stimulation blood circulation without the need for intensive exercise and as such reduces your risk of re-injury. Using the T•Shellz Wrap® is truly a unique experience. Within moments of applying a treatment to your injured bursa, you can feel the healing sensation due to the increase in blood flow deep within the area. During a treatment, and for quite some time after you finish, the treated area will feel relaxed and less painful. It's a very soothing sensation and extremely effective. If you have injured your muscles or tendons or other soft tissue in your joint, then the T-Shell Wrap will accelerate your body's healing rate via increased blood circulation. 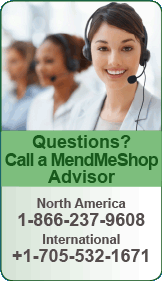 If you are dealing with conditions affecting your range of motion such as bursitis, an impingement or even arthritis. If you have a chronic soft tissue injury that has lasted for years- this device will help start the rebuilding process and help strengthen the surrounding and supporting tissues. Many of our past clients had suffered for years, then were completely amazed at the results only after a few months of treatments. If you are still working with an injured bursa , the T•Shellz Wrap® will help relax injured soft tissue prior to work and after a day at the job. If you are experiencing atrophy and want to reduce the chance of re-injury - this is a perfect treatment to use on a regular basis. T•Shellz Wraps contain a unique, flexible Carbon Fiber Energy Pad which is flexible and will shape to conform to your body. This Energy Pad emits a uniform wave of perfectly safe electromagnetic energy over its entire surface. This energy travels deep inside to the muscles and tendons in your body, stimulating blood flow your own body needs to heal your injury. It is the electromagnetic energy that is crucial to the healing process. Have you ever wondered by an athlete can return to activity after 3 or 4 weeks following a soft tissue injury - while your average person takes much longer to return back to normal? The secret isn't really that much of a secret - it involves consistent treatments (meaning multiple times a day) using a diathermy treatment like the T•Shellz Wrap® to stimulate blood flow in and around injured soft tissue. Often, athletes have the luxury of using in-house therapy facilities many times per day. 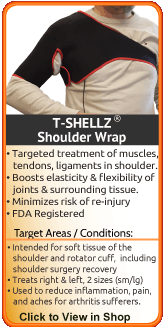 We believe the T•Shellz Wrap® to be one of the most effective deep-tissue heat treatments that can be used at home. Deep heat will stimulate blood flow to dense, injured tissues such as bursae, muscles, tendons, ligaments, and other similar tissues. Benefits That Can Be Achieved Via the T•Shellz Wrap®.. When Should I Use My T•Shellz Wrap® During the Day? Before you know you will be using your injured joint (going to work, driving, walking/running, etc). We Guarantee That If You Use Our Products on Your Bursitis for 60 days as Directed, Your Bursitis Pain Will be Greatly Reduced or Eliminated and Your Joint Flexibility will Increase. If This Does Not Happen, We Will Refund Your Money. 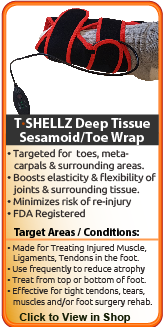 We are an FDA Registered Company, and our TShellz Wrap, also know as a Deep Tissue Rehab Wrap, is an FDA Registered Medical Device suitable for use in hospitals and therapeutic clinics. 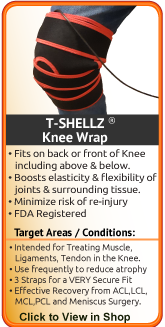 Since it is deemed safe for patients to use themselves, the TShellz Wrap can be used for home treatment. Since you are reading this, you probably know that serious bursitis does not just disappear. Over time, it will usually wreak havoc on you due to lack of movement and over-compensation. It will often causes secondary strains and tendon injuries on your other joints due to overcompensation. Recovery takes a longer time for such chronic (long term) injuries, but proper healing is essential to regain strength and get you back to the activities you enjoy. The longer your bursitis endures, the greater the risk of running into serious overcompensation injuries. To Stop Re-Injury & Reduce the Risk of a More Serious Overcompensation Injury, Heal Your Bursitis Quickly & Completely! A Cold Compress or Ice Pack to reduce inflammation of the bursa (as soon as possible). A Deep Tissue Therapeutic TShellz Wrap to increase blood-flow to area where you are experiencing bursitis(Deep Tissue Therapy Therapy). 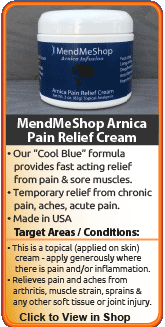 MendMeShop Arnica Pain Cream for temporary relief of pain due to bursitis pain. An Exercise & Stretching Plan to prevent muscle atrophy and shortened tendons. A proper plan will increase elasticity and strengthen the muscles and tendons of the affected joint. 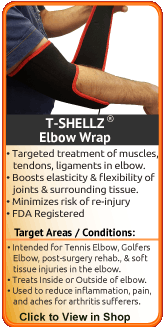 We believe the use of T•Shellz Wraps for effective treatment of bursitis is one of the most under-utilized home treatment options available on the market today. We have thousands of customers that have tried many options out there and have been amazed at how effective and fast the TShellz Wrap treatment can deal with soft tissue injury. Inflamed bursae cause extreme pain and reduce your ability to move. We all know that if the injury was healed, the pain would go away but what about the opposite situation? If the pain was gone, does that mean the injury is better? Unfortunately, that is not always true. Just remember that an injury is not healed just because the swelling is gone - this is why you need to keep treating the injury with Deep Tissue Rehab. Most sufferers of bursitis or chronic bursa pain will recover more quickly if they treat their injury correctly. If you have a bad bursitis injury and/or tendonitis condition, you will benefit greatly by treating your injury correctly. That means using the right therapies every single day. Promoting blood flow around an injured area to help the body heal itself is a concept that has been utilized for centuries. Oxygen and nutrients, carried within the blood, are critical for the body to heal itself. Without proper blood flow, recovering from an tendinitis injury or bursitis condition will be delayed...sometimes for a very long period of time. Even though the concept is simple, improving blood flow can be difficult. When the injury is bursitis related, the challenges are even greater. Traditional methods require your joint to move to promote blood flow, but that same motion that promotes blood flow can also lead to making your pain and condition worse. Have you aggravated your bursitis doing light exercises/stretching? Have you aggravated your bursitis just trying to perform basic tasks around the home? 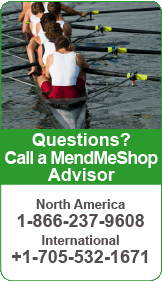 Is your bursitis injury preventing you from activities you love to do? Most people we deal with tell us these scenarios have happened to them many times in the past. The real challenge is how to promote blood flow to the joint without causing further injury. This goal is further complicated by the fact that most bursitis injuries arise in our most commonly used joints. Shortened muscles and tendons due to lack of use is a real problem during recovery. When you start to feel better and use the joint, the shortened muscles and tendons get over-strained, introducing small microtears. These microtears start the formation of scar tissue, which unlike muscle or tendon, is completely inflexible. Once there is scar tissue in there, the tears will continue; eventually you've got a serious problem with a joint that does not flex as much as it did before and this becomes a chronic condition. You'll know you have scar tissue when you get shooting pain if you stretch your joint too far... it is something that physical therapist's often deal with (ie. shoulder manipulation). To prevent this, use the TShellz Wrap before undertaking any significant activity, as this treatment will actually increase the flexibility of muscles, tendons and ligaments. This is actually why we advise plantar fasciitis sufferers to treat themselves with a Plantar TShellz Wrap first thing in the morning before walking (walking stresses the plantar ligament on the bottom of the foot). After treatment, the plantar ligament is more flexible and can handle higher walking stresses before it starts to micro-tear. The ability for soft tissue to stretch further before micro-tearing will allow you to gently stretch your recovering joint without re-injuring it yet again. This is a huge boon for recovery. We also highly advise the TShellz Wrap it for post surgery recovery, as surgery will always introduce scar tissue and TShellz Wrap treatments in post-op recovery will reduce scar tissue growth, increase joint flexibility and get you back on your feet faster. We all know that if the injury was healed, the pain would go away but what about the opposite situation? When there is no more pain, does that mean the injury is better? Unfortunately, this is not always true. Too many people only focus on suppressing pain symptoms while providing less attention to the true healing aspects of the body. Experiencing less pain, while obviously a good short-term goal, never equates to underlying healing. Scar tissue can remain for months after one gets to a point of being relatively pain-free. However, as long the weak and brittle scar tissue remains, you are susceptible to re-injury or re-aggravation. Certain motions or movements can cause weaker soft tissue to easily tear - resulting in some reversal of the recovery up until that point. Ongoing treatments to enhance circulation will soothe, relax and promote healing of your damaged hamstring muscles and tendons. T•Shellz treatments will also allow your soft tissue to extend further due to the deep heat effect created by the electromagnetic energy emitted deep into the treatment area. The more extensible your tissues are, the less likely they are to strain or sprain. If you're tired of being told that resting, drugs and surgery are the only answers to your bursitis.... Be optimistic, because there are effective alternatives for you. You will not be left in the dark after purchasing any product from us. AidMyBursa Advisors and Product Specialists are available Monday to Friday by toll free phone or email to answer your questions or concerns. Based on feedback from our customers, we have found that treatments for bursitis are overwhelmingly successful! 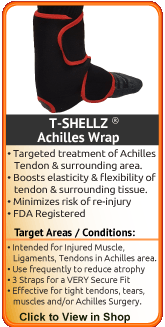 The short answer is - yes, the T•Shellz Wraps are very effective home treatment devices for soft tissue injuries. We try and keep in touch with a large percentage of our customers, and we encourage them to do the same. 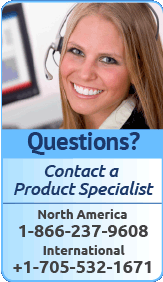 In doing so, we have received a lot of feedback as we have sold Electromagnetic Devices since 2008.